Since 1839, The Marquis of Lansdowne has stood on a quiet corner in Hoxton round the back of the Geffrye Almshouses (which became the Geffrye Museum in 1914) and it is not unlikely that a few pensioners from the almshouses might have frequented the Marquis on occasion. It is a quintessential London public house and, as in so many East End streets, forms the lynchpin of the neighbourhood. Historically, pubs stood as a counterpoint to the church – offering temples where men sought solace from the pressure of their working and domestic lives. Yet in recent years hundreds have gone, taking away community meeting places and impoverishing social life. The Marquis of Lansdowne closed in 2000 and now belongs to the Geffrye Museum which describes itself as “the museum of the home.” Disappointingly, the Museum wants to demolish the pub and clear the site for a new building by architect David Chipperfield. They are passing over the opportunity to restore this dignified Regency building and include it as part of the museum, enriching their collection and broadening the story they tell of the lives of working people by showing “the home from home.” According to the Museum’s current plans, The Marquis of Lansdowne and the history it represents are destined to be erased, giving way to pavement widening and a plant room for the new structure. 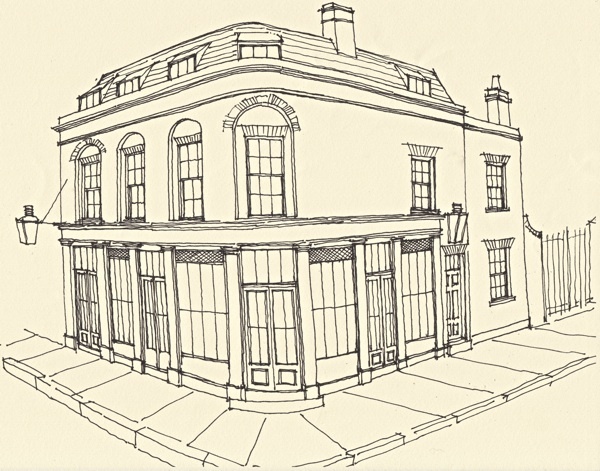 In November, Tim Whittaker, Director of the Spitalfields Historic Buildings Trust (who won the Country Life Restoration of the Century Award for his outstanding work in renovating two modest early nineteenth century terraces in Whitechapel) wrote to the Geffrye Museum asking them not to demolish The Marquis of Lansdowne, and offering to take on the pub and restore it to its former glory. 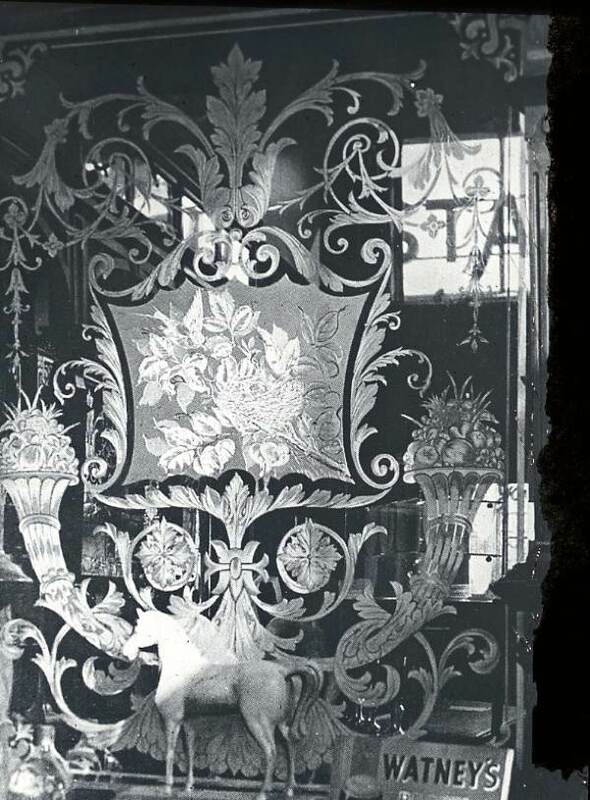 The Spitalfields Trust proposal included the option to work in partnership with the Museum or to buy The Marquis of Lansdowne, renovate it and lease it to a tenant. Since the Geffrye’s Museum’s projected edifice on this site is to include a bar and restaurant, you might hope that an architect could embrace the opportunity to make The Marquis of Landowne the starting point for the design of the new structure, finding a sensitive and ingenious way to connect the pub with the existing Museum buildings. Yet the Geffrye Museum rejected the option of retaining The Marquis of Landowne, pursuing instead the notion of another signature building by a star architect to add to the one they opened in 1998. However, the application for £16.3 million funding for the new building has yet to be approved by the Heritage Lottery Fund and maybe questions will be raised about the validity of using Heritage Lottery money to destroy our heritage? 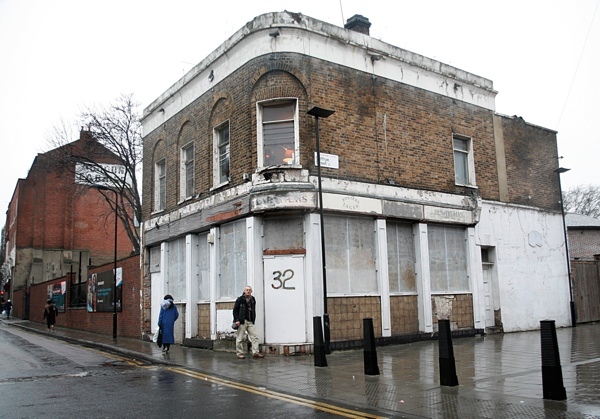 Equally, Hackney Council Planning Department has not yet given its consent to the demolition of The Marquis of Lansdowne which they have identified as a “heritage asset” within a Conservation Area. The Geffrye Almshouses were originally built by the Ironmongers’ Company in 1714 and the Museum itself was created as a result of a public petition when these historic buildings were threatened with demolition after the Ironmongers moved their almshouses to Kent one hundred years ago. In their enlightenment, the London County Council responded to the petition by creating the Geffrye Museum dedicated to the history of the furniture industry that thrived in Hoxton and Shoreditch at the time. A century later, there is a new public petition addressed to the Geffrye Museum itself – asking them to grant a reprieve to The Marquis of Lansdowne, showing respect for the culture of the working people of London by integrating it into the museum, and thereby acknowledging the significance of the public house in all our histories. I urge you to spread the word to your friends and family throughout the festive period. A local landmark in Hoxton since 1839. Far better to re-open it as a PUB! Have the relevant branches (East London, North London,) of CAMRA been informed? I really do despair at the idiocy of people who should know better. A museum destroying our heritage? Heritage money used to replace our past with another awful modern building? The money and support seems to be there to do something with this magnificent building so it’s an absurdity to even be contemplating demolishing it. 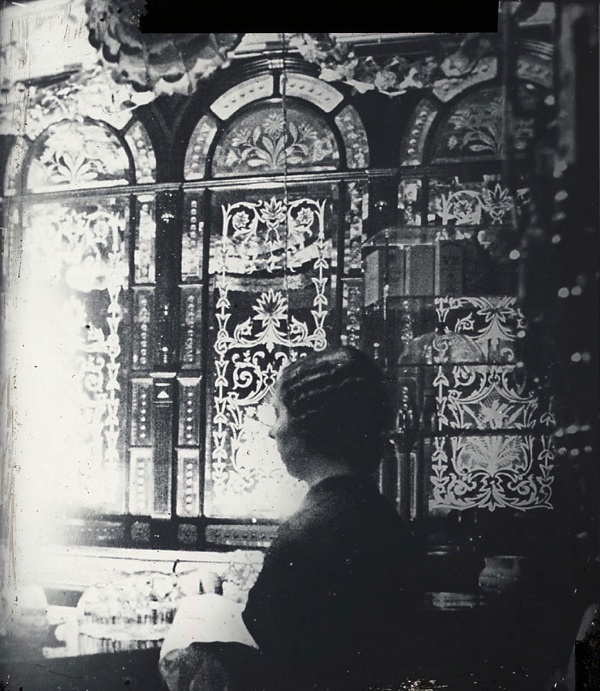 Those mirrors are amazing… Do any of the original fittings still exist inside the pub? There also seems to be a large area of open space around the building… Could not the proposed changes be made to incorporate the business part of the pub, such as the bar and cellar? The top half could be incorporated into the new build by having the Bar/Restaurant partly above the renovated pub. You just know that in the end it will be demolished regardless of any protests. I read an article a while ago about the squatters who were living here, a group of artists I believe. Not sure if they are still there, but this building has always had a special quality now I can see why. With the overground and the gentrification of Shoreditch creeping up there’s a real danger this will become just another boring cafe/restaurant.. how wonderful if it could be saved. Even if it were not a pub, it could be restored with it’s original character and the community would learn something about what came before. Sad irony that The Geffrye can’t take the initiative here. I can understand a building being demolished if nobody can find a use for it. However when a building like this, rooted in the social fabric, can be revived and even used for its intended purpose it is a perverse mind that wishes it to be demolished. If it was in the hands of a greedy corporation weighing up the potential profits for its shareholders it would make more sense. But for a museum to do it would be wanton vandalism. Perhaps the trustees of the Geffrye need to read their museum’s history and remind themselves who they are and what they represent. Do hope it can be saved. I went to an art exhibition there earlier this year, was brilliant. 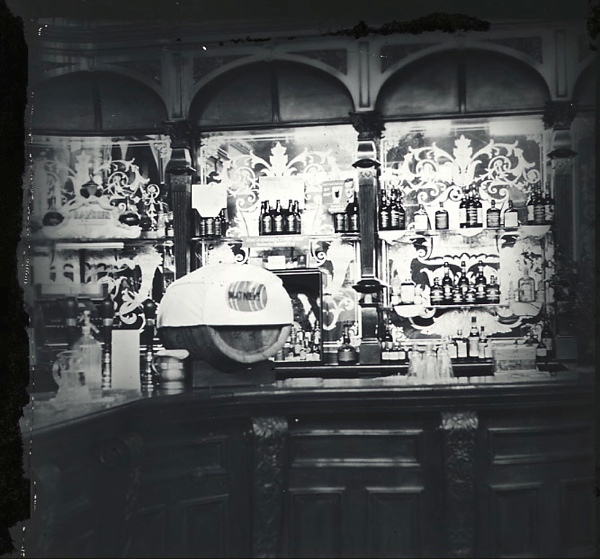 The artists had furnished the rooms to make it look like the Victorian pub it was, it was very atmospheric and magical. The building is quite run down inside and the original fittings have been removed. Apparently it had a horseshoe bar in the middle of the room. A fine post and cause, but rather than being a ‘museum of the lives of working people’ the Geffrye is very firmly focussed on the recreated living rooms of what it calls ‘the middling classes.’ There’s barely a word anywhere inside about the workers of the Shoreditch furniture industry, often very poor, who made the furniture displayed. To now demolish a public house, which many would have used to escape the cramped conditions of their not so ‘middling’ homes, adds insult to omission. Come on Geffrye – do the decent thing! What a great opportunity this could be to tell another side of your story, not add another designer trapping to your collection. As a seven year old we lived close by the pub and my mum used to send me to the pub to get him to come for lunch. I remember having to wait for someone to open the door as it was to heavy for me to open . Memories about to be flushed down the toilet. Sad but money and bribes to officials seem to win every time! This is in addition to the awful loss of the Flying Scud. A landmark for all who knew the area. The Flying Scud; at the other end of Cremer Street. The Geffrye Musem is letting us down bigtime if this goes ahead. 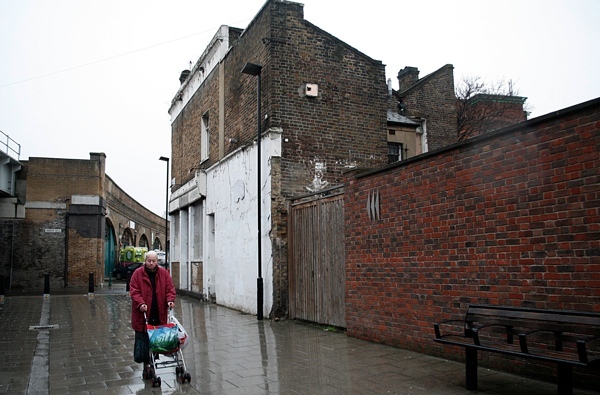 Shameful.
. . . ultimately, here in East London, and indeed across Britain, we need to decide if we want to live in a sanitised Post Modern Disneyfication of our past or if we are prepared to be bold and make space for the future . . . which sometimes leaves no room for compromise . . .
Far from being cosy centres of the community many East End pubs were sites of misery . . . of men spending money on alcohol while children went hungry . . . drinking spells the precursor to violent late night domestic confrontations . . . This pub most likely closed because it became economically unviable . . . and who knows how many were glad of its passing . . . ? I do agree with Alan that the museum is lacking in the remit that it has adopted . . . and that of a traditional pub might add depth, but the interior of this one is long gone . . . Yes, have been here in the recent past when artists and designers were using the building. So this pub building goes on – and should go on. Why demolition? What justification is there? It seems we can never stop fighting demolitions in the East End. 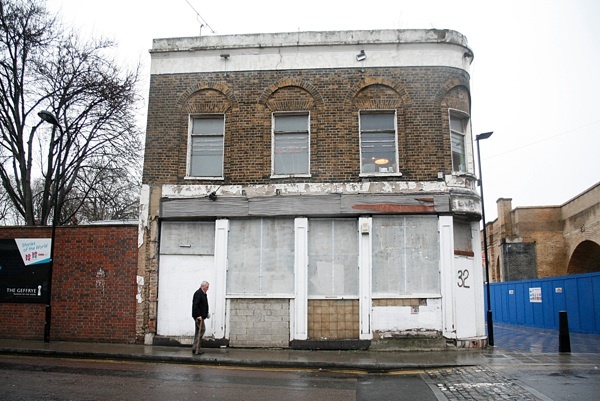 In Tower Hamlets it is the perfectly preserved ‘The Gun’ public house in the group of three 1920′s Spitalfields Market buildings that is about to be demolished and in Shoreditch, this 1839 public house. Agree with Alan Gilbey that the pub building should be preserved as these (and I have been told, the cinemas, where the heating was on, and the grandmas could sit in comfort, reel after reel), were refuges from cold and cramped homes. Also homes where work went on – the sewing machines of pieceworkers is never relaxing! Why the Geffrye Museum could not incorporate this corner building in their scheme, and re-instate the pub interior, when interiors is their game…this would also surely attract Heritage Lottery Funding, while as you say, GA, flattening heritage is hardly likely to qualify. So, it’s another fight to save built heritage. 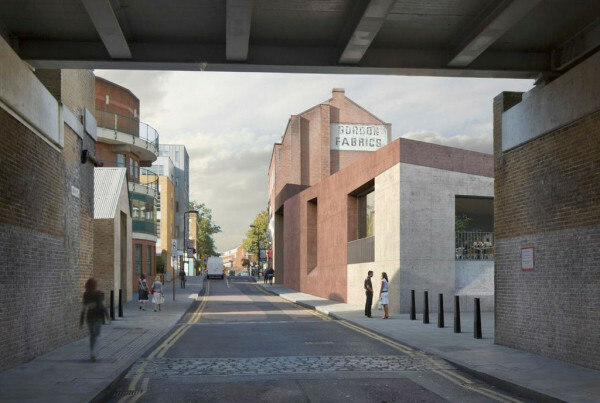 At least these heritage assets in a conservation area (just as The Gun, Barclays Bank and the Fruit Exchange at Spitalfields are) are yet to be decided upon by Hackney Council. Those of us in Tower Hamlets must help with this neighbouring pub – and the Museum, which many of us appreciate, too – and object via the petition and support the Facebook page. There was a piece on this in Private Eye’s Nooks and Corners – so the Marquis of Lansdowne demolition is getting national bad press. These developers and architects must stop and think again. Come and check the place out before it’s gone forever. Whilst there aren’t many original features left in the pub, its a unique and interesting place. community before culture …if the other way round…both will collapse. There are too many concrete block buildings in London today. Keep the Marquis of Lansdowne! The Geoffrey Museum has all the space it needs. I find Dewing’s remark callous and insensitive. For shame! All history deserves respect! I really feel this should be taken up with HLF whose funding will be used to effectively destroy a heritage building in favour of a modern monstrosity that will look awful after the effects of a few years bad weather. Good luck to all those campaigning to save this building. I used to live there as a child: my brothers and sisters were born there. It is a magical place, with quite a lot of interior features still there and capable of being renovated at relatively little cost. 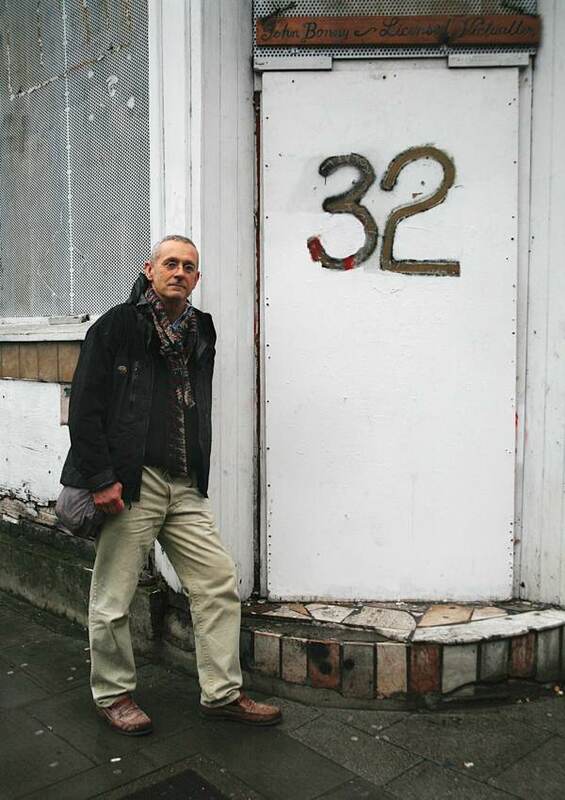 We were back in there recently and the squatters – who looked after the place pretty well – have gone. It’s not beyond repair but it it will require some structural work on the exterior walls at the rear. Let me know if there’s anything I can do to help to save the old place. I am currently looking at the Marquis of Lansdowne for a University Project.